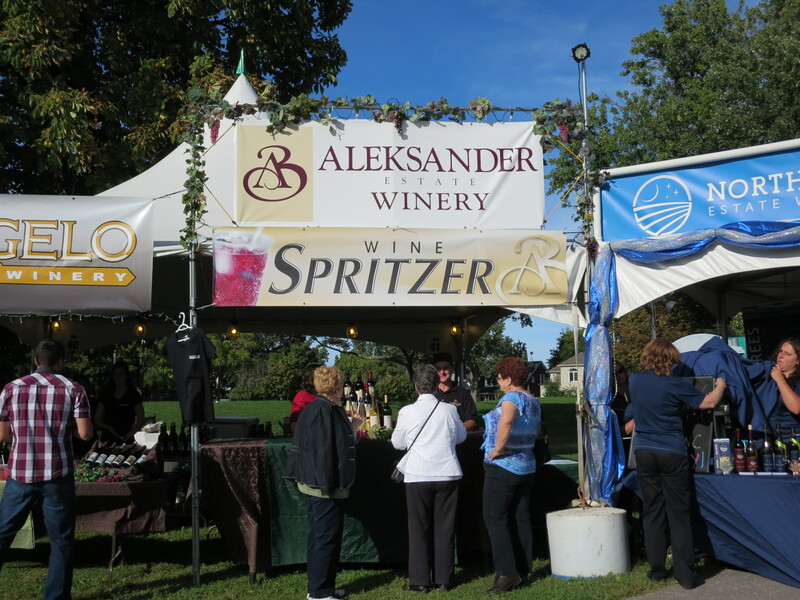 Keeping up with what’s new in the Niagara-on-the-Lake and Niagara Escarpment regions each year usually means checking out new wineries. 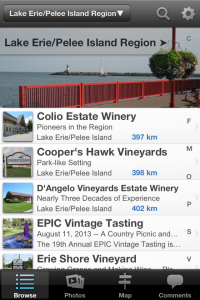 Keeping up with what’s new in the Erie, Pelee Island, Coast (EPIC) wine region means visiting old favourites that are kicking it up a notch and becoming destination wineries. 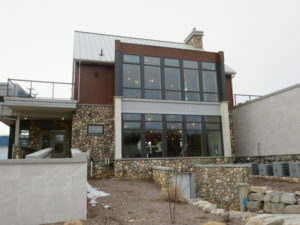 My first stop last weekend was to North 42 Degrees Estate Winery. A couple years ago they had posted artists’ drawings of the restaurant they were planning. It looked impressive from the drawings, but it also looked like it might take awhile to build. Then, at some point last year I thought I read an announcement that they had opened the restaurant. So, in planning my trip, I went on their website to find out a bit about the restaurant – things like the menu and the hours. Their website made no mention of the restaurant, so I figured it wasn’t yet open. Just to be sure, however, I also checked their Facebook page. On it there was reference to various special events at Bistro 42, but nothing indicating they had regular hours of service. Curious to see what was going on, I planned to stop there. To my terrific surprise, at the far end of the driveway I saw the new building. It looks as though it organically sprung forth from the ground. In the front there’s a trio of huge beams reaching up at odd angles to support a massive front portico. Similar beams support a glass room off to one side. The main part of the building looks like a two+ story glass cathedral. From the inside, the feel is more intimate than you’d expect. The main floor features the tasting room and a room that houses Serenity Lavender, which is owned by the same couple who own the winery. When I visited the winery, the door to the lavender store was wide open and – though I love the smell of lavender – I wondered how folks at the tasting bar might find the clash of smells. Though I couldn’t stay for a meal that day, the host graciously encouraged me to check out the main dining room upstairs and I’m glad I did. The view over the vineyard was lovely – even in the dead of winter. I can imagine it is spectacular in summer and fall. Their menu features small and shareable plates, as well as a nice selection of salads and mains. As it was just after Valentine’s Day, they also had a special menu that weekend. From the crowds, it looks like it’s quite a popular spot. 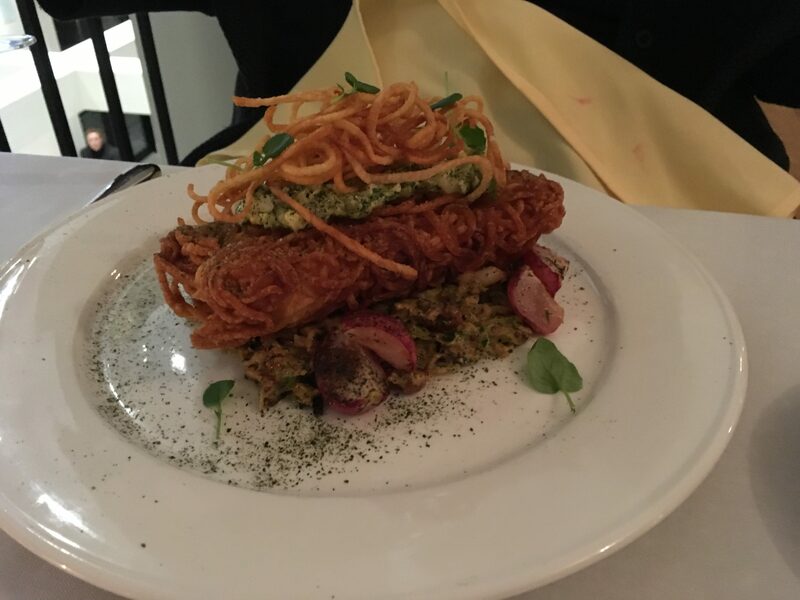 Now that I know it’s open, next time I’m headed to the region, I’ll make a reservation at Bistro 42 – I can’t wait to try it. The restaurant at Oxley Estate Winery keeps landing on different “best” lists. I think it’s been on Open Table’s list of best winery restaurants and most recently their list of “most romantic” restaurants. I’m really not surprised that it’s on so many “best of” lists. The atmosphere is casual (the restaurant was, after all, a barn at one point) but elegant and the service is friendly and knowledgeable. All those things are notable, but the food is really the main event here. 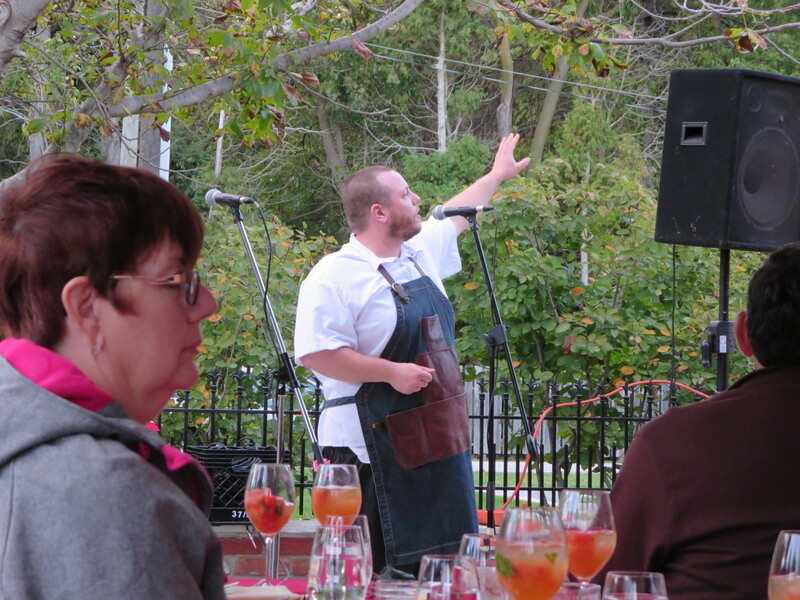 Chef Aaron Lynn has been at Oxley for about five years. Over that time, he has created all sorts of dishes and he has really grown. 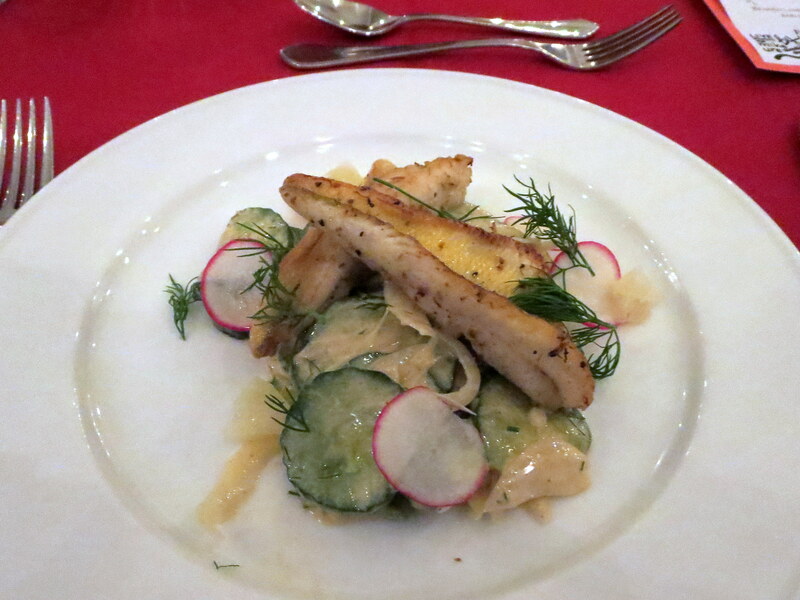 His regular, seasonal menu is always interesting, but the special dinner menus really showcase his talent. I was lucky enough to enjoy dinner there last weekend when they were featuring a Valentine’s Day menu. 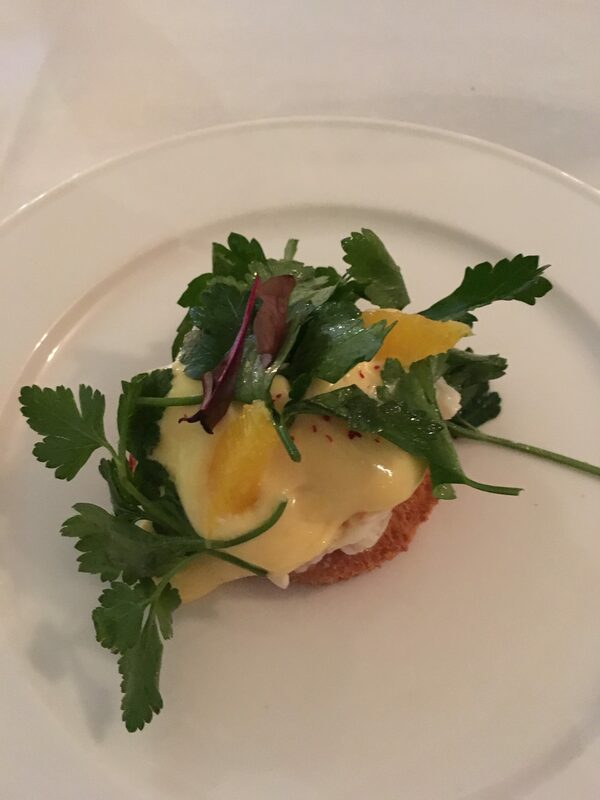 The Crab Toast appetizer was nothing short of divine. Huge chunks of crab with a luscious hollandaise atop a perfectly toasted brioche. Because rib eye is my all-time favourite cut, I couldn’t resist the bison ribeye. 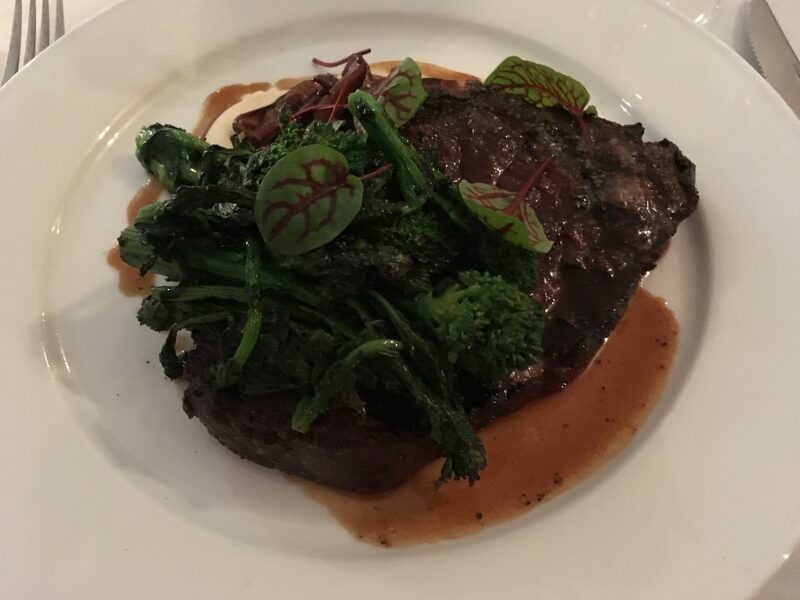 When I ordered it medium well, the server gently mentioned that the chef recommends rare or medium, as bison is so lean. I took the advice and I’m glad I did. It was perfect. 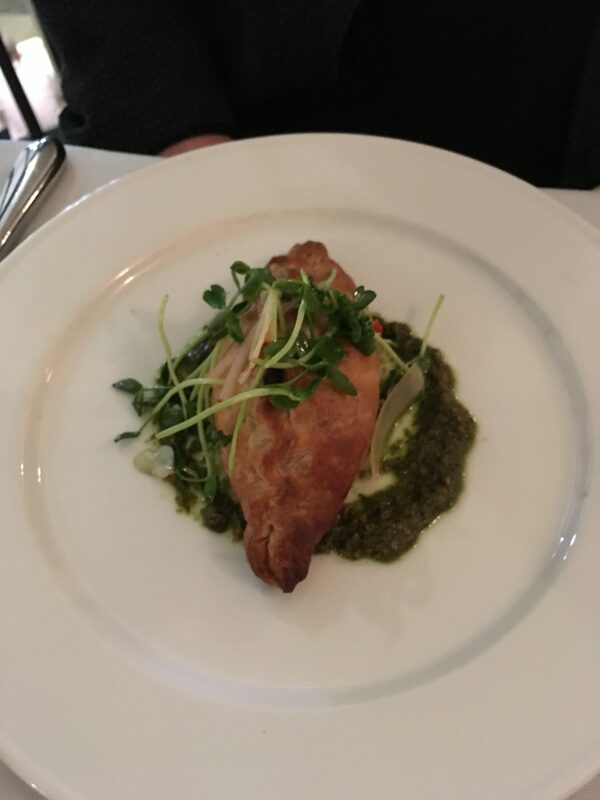 My dinner companion was equally happy with her choices of a Wild Mushroom Pastie as her appetizer and Potato Wrapped Halibut for her main. 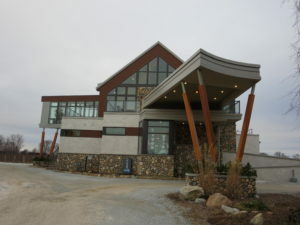 CREW – Colchester Ridge Estate Winery – is right next door to North 42 Degrees Estate Winery. A huge new building is going up at CREW. Currently, their small tasting room is at the far end of their driveway in a non-descript building. The new building is far along, but wasn’t quite finished, so I didn’t snoop around. But, given its size and location in the front of the property, it wouldn’t surprise me if they too are planning a restaurant or some other food-serving facility. 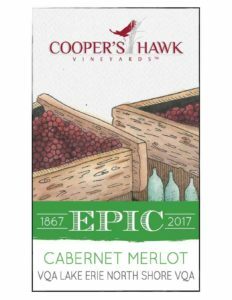 As for new things happening at another winery I always enjoy – Cooper’s Hawk Vineyards – they are now making cider. (Cider is hard to come by in the region – it’s not taken off there like it has elsewhere in the Province.) Their Iler Road Cider, which is no doubt named after the street the winery is on. is made from 100% Essex County Apples. 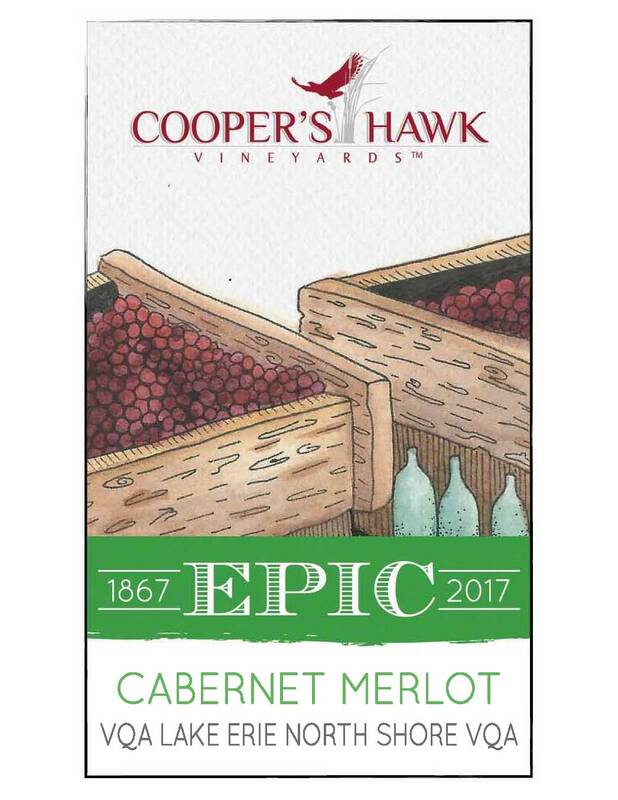 So now, in addition to their wines and The Vines restaurant, there’s yet another reason to visit Cooper’s Hawk Vineyards. 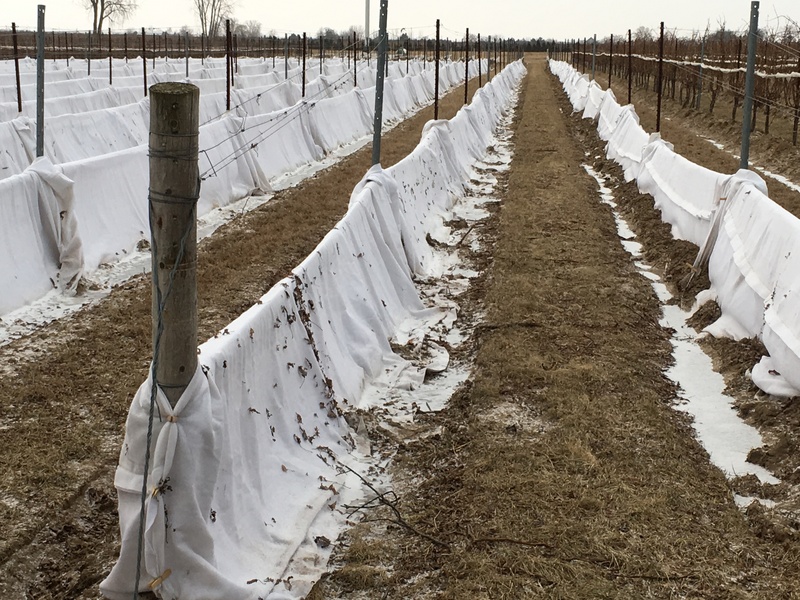 As pretty much the whole province has experienced spurts of on-again/off-again arctic cold, it’s only natural to wonder (even worry) about what these extreme temperatures must be doing to the vines. 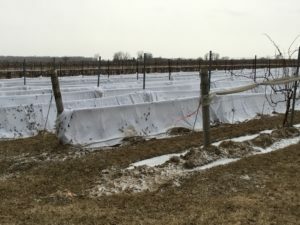 After the last polar vortex winter a few years ago, I couldn’t help notice how many wineries have purchased wind machines. And who can blame them, when a fraction of a degree more warmth in the air swirling around the vines on a cold night can make the difference between a healthy yield and an increase in the amount of bunches that end up as verjus. 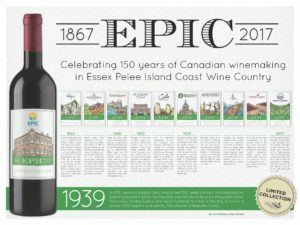 On the recent family day weekend, I visited the EPIC wine region (Essex, Pelee Island, Coast) on the shores of Lake Erie. Though the region is further south than other regions in Ontario, it’s not immune to extreme weather. Indeed, wineries in the area no doubt vividly remember 2014 when they lost most of their crop due to cold winter temperatures. 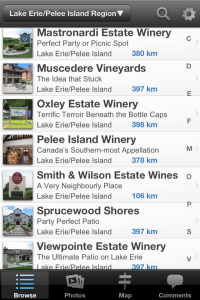 A few weeks before my visit, I was in touch with Ann Wilson of Oxley Estate Winery. I asked her whether they were concerned about this winter’s extremes. She basically said that they manage what they can manage, but they won’t know till spring what the impact really is. But then she added a comment that intrigued me. She said it’ll be interesting to see whether their experiment in “blanketing” their Merlot and Syrah pays off. I didn’t get a chance to ask what that meant, but as I headed to the region, I kept my eyes out to see if I could figure out what she was talking about. As I neared Oxley on County Road 50, I saw white, pup-tent like coverings on various rows of vines on the corner of one of their properties. Clearly this was what she was talking about. After stopping to snap a few pictures, I found Ann and Murray and asked them about it. They said they heard that some wineries in Prince Edward County (PEC) and Quebec have used these blankets (geotextiles) as a way of protecting the vines and that the wineries have had success with them. 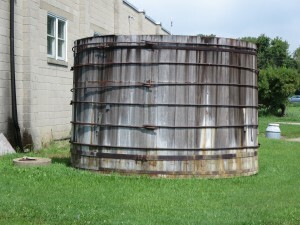 So, last year Murray and Ann visited PEC to learn more about it. They decided to give it a try this winter. 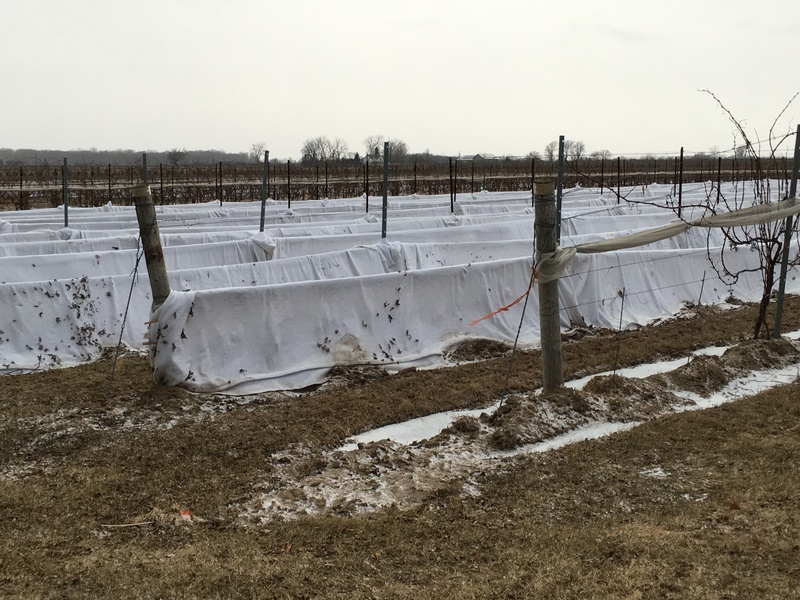 According to Murray, the idea behind the blankets is to create kind of a greenhouse effect atop the vines. When the geotextile gets wet, it freezes and then the warmth of the sun and the heat from the ground stay trapped beneath the blanket. While it sounds simple, actually placing the blankets on is quite labour intensive, he said. 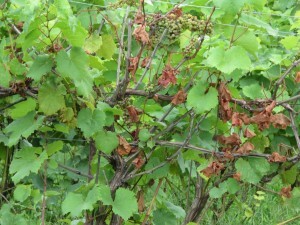 For one thing, they have to prune in the fall, rather than in the late winter/early spring. They also have to lower the trellis wire and tie the canes to the lower wire. Then they have to find a way to deal with the metal poles that run the length of the row to hold up the trellis system. One of the blanket edges has a wire on it that helps keep it down, but the other edge they weight down with dirt. Since this system is not widely used, the timing of when they’ll remove the blanket is another matter. 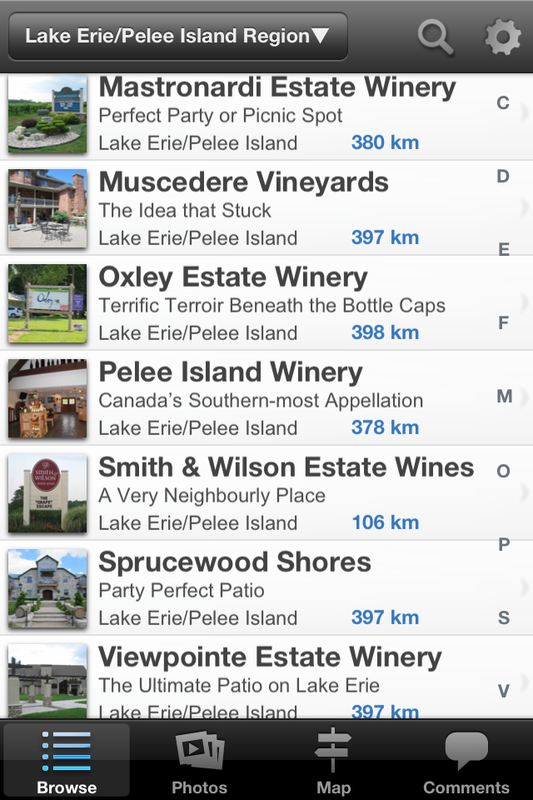 The fact that there aren’t many wineries using this system means there’s limited experience to draw on. And, since the growing season starts sooner in the EPIC region than in PEC, it’s a decision Oxley will have to make on its own. I think many local growers will be paying close attention to how this trial works at Oxley. One thing’s for sure, they couldn’t have picked a better winter to test this technique. If it’s successful and proves worth the added time and expense, growers will have another tool to help manage the impact of climate change. 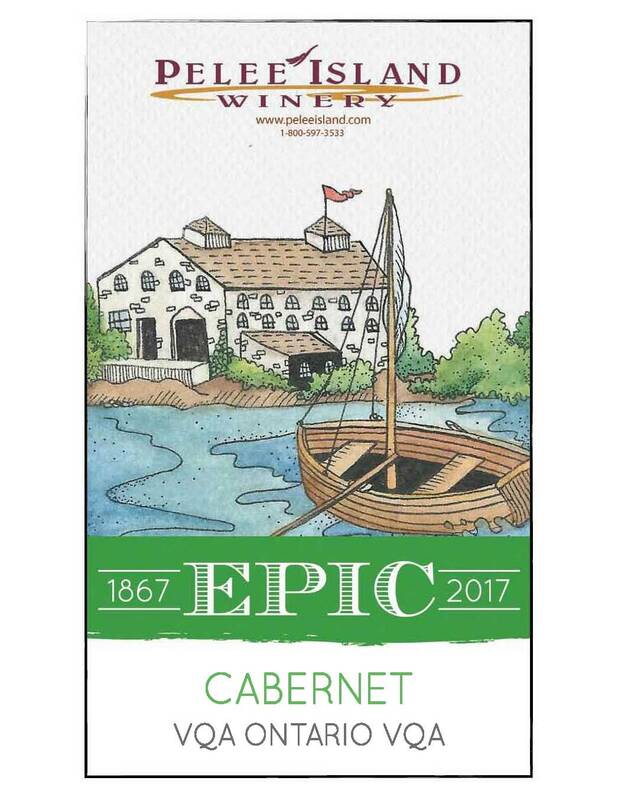 I’m continually impressed with the ideas Ontario wineries come up with and I’ve been wondering what some might be doing to mark Canada’s 150th birthday. 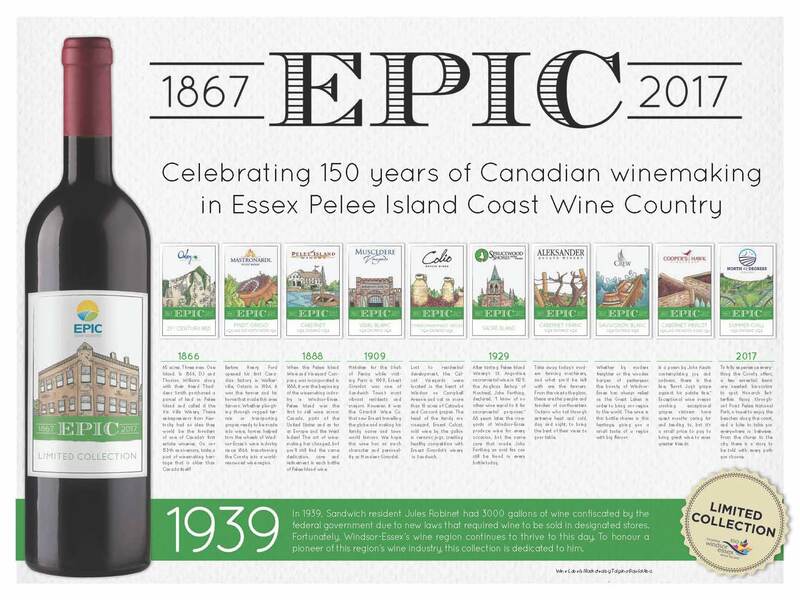 Well, 10 of the EPIC wineries (the acronym stands for Essex, Pelee Island, Coast wineries) have released a special, limited collection of VQA wines under the EPIC 1867 banner. Each of the participating wineries have produced one wine that features a custom-designed label that talks about an aspect of the region’s rich winemaking history, which actually pre-dates confederation by a year. And, in keeping with the theme, each bottle retails for $18.67 (plus bottle deposit). 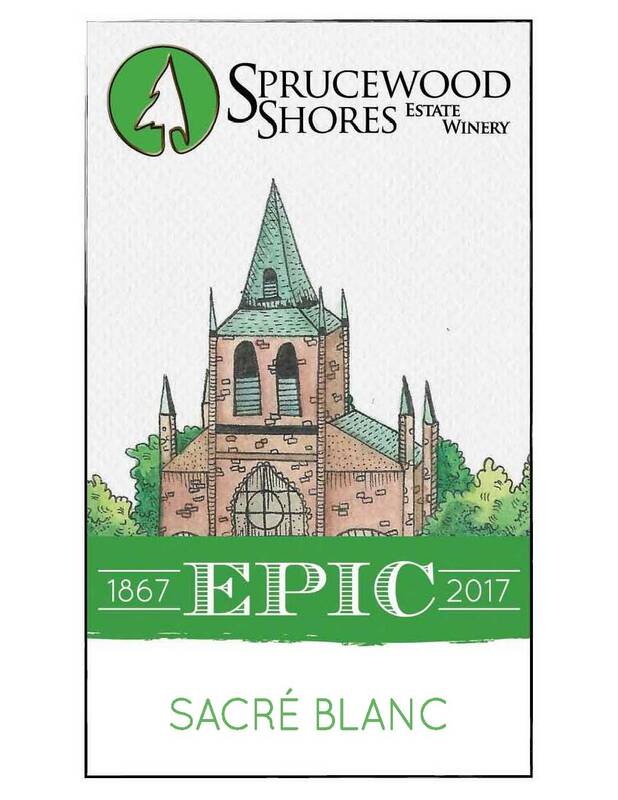 The idea behind the project was three-fold: to celebrate Canada’s sesquicentennial, to commemorate the role the region had as the birthplace of the Canadian wine industry, and to showcase the vibrancy of the region’s wineries today. 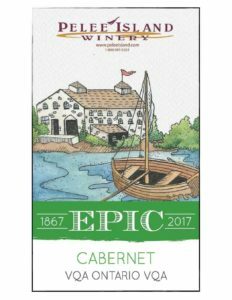 The limited edition wines (Melissa Muscedere of Muscedere Vineyards Estate Wines says that each winery produced only 100-150 cases of their featured wine) were released May 27th and are available while they last. 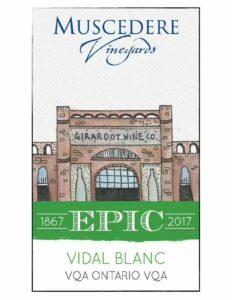 You can also get a commemorative poster ($10) that features all the different labels and the story – actually, the history – behind each. 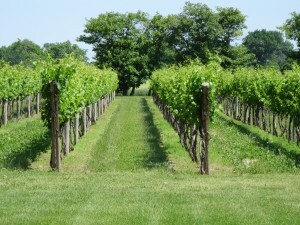 I was visiting some friends who live in the wine region along the north shore of Lake Erie, south of the Windsor/Detroit area. It’s the kind of place where people often give the name of the county, rather than the town where they live, because they figure more people have at least heard of the county. It’s primarily an agricultural area, but it’s got more of a small town feel than a rural feel, if you know what I mean. One of the highlights of the weekend was a special dinner at Oxley Estate Winery. The formal title was: Oxley Celebrates Home. If you guessed they were doing the locavore thing, you’d be right – but with a few added twists. It so happens their young chef (Aaron Lynn) is a local kid who went away for culinary training and, after honing his craft working in some fancy restos, he returned to the area last year. 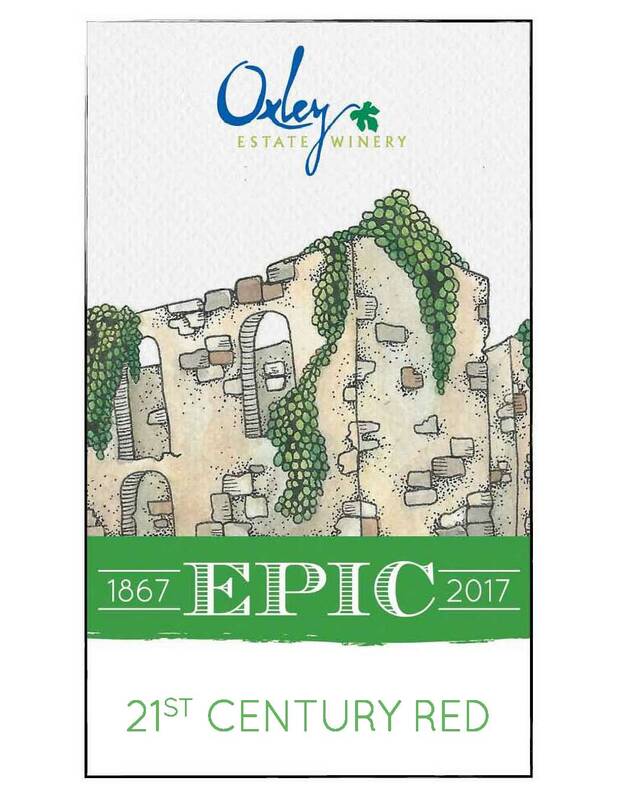 Lucky for Oxley Estate and for those who have a chance to eat at the winery. Not only did each of the five courses feature local ingredients, the chef named the dishes after the local purveyors – a nice touch, I thought. So, for example, we dined on Todd’s Perch (named after Todd, the local commercial fisherman the restaurant buys from), Rick’s Lamb, and Farmer Doug’s apples. But that wasn’t all. Before the meal, the chef introduced all of the local suppliers and asked them to stand so we could honour and recognize them as the people responsible for all the good things we were about to enjoy. And, the celebration of things local didn’t end with the food. Ann, one of the owners of the winery, introduced the musicians who would be entertaining us. Turns out they too were from the area and when they’re not in town, they’re in Nashville working as backup musicians to some well-known country music stars. During the dinner I was chatting with a woman sitting next to me. She was a local and so I was asking her a bit about the area. We talked about one of the bigger towns in the county and about how much it’s growing. The town’s population is up to about 21,000, which is pretty big, as towns go. And, like many Ontario towns, there’s a definite centre with some small shops, a few restaurants, a couple banks, and a library. But, the pickings were pretty limited in town. I wondered aloud where people go if they have any kind of serious shopping to do. She laughed and said that these days, she can get pretty much anything on-line. But, if there’s something she can’t order, it’s probably available in Windsor, which is “only about 25 miles away”. Then I asked about grocery shopping. I had noticed that there are two well-known supermarkets, but I’m used to checking the weekly fliers of at least four major chains before I go grocery shopping. She said she didn’t care that other major grocers weren’t around. “I love shopping at those supermarkets. The people that work there are my neighbors and friends – why would I go anywhere else?” I was really struck by her response. Later in the conversation, the topic of the refugee crisis came up. She mentioned she’s catholic and she said that in the next few weeks her church would be deciding on whether they will take in a refugee family, as the Pope has suggested. She said she’s going to push hard for them to do so. I hadn’t heard about the Pope’s suggestion that every parish should sponsor one family, but it struck me as being in line with something else I read the Pope said about the current wave of refugees. He urged people to not see the crisis as involving hundreds of thousands because it’s just too overwhelming. Instead, we should respond to them as individual people – just one at a time. Though it’s such a simple idea, it’s about the most concrete, constructive idea I’ve heard from any leader about how to deal with the situation. I smiled at the idea of some refugee family settling down there and eventually calling themselves locals. After dinner, I was thinking about how the theme of the evening could just as easily have been “the joy of human interaction”. Living in the city has its conveniences, opportunities, and even independence. But, if you’re not careful, city life can also bring with it a loss of connectedness. Fortunately, the condition isn’t irreversible. My weekend in the country reminded me that the best way to feel connected again is to celebrate what each individual brings to your life. If you do that, I think you’ll feel at home wherever you are. On a recent trip to the Lake Erie/Pelee Island region to visit wineries, Ann Wilson, owner of Oxley Estate Winery suggested I stop in at Lakeside Packing Company — she thought that being a foodie, I’d be interested in their business — and their story. Boy was she right! 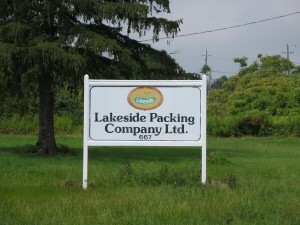 Lakeside Packing Company is just a few doors down from Oxley Estate Winery on County Road 50. Ann’s interest in them started when Oxley, which happens to have a large asparagus patch, was looking for a way of packaging their pickled white asparagus. Turns out, she didn’t have to go far for her solution: Lakeside Packing. Lakeside Packing is third generation family business that’s been around since 1942. Founder Charles Woodbridge started the packing business when he was looking for a way of preserving vegetables (in part to use up surplus crops) so that consumers could enjoy them year around. 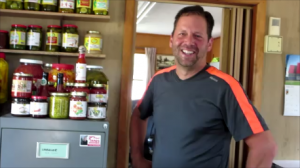 Using old family recipes, he started pickling different produce (pickles, mainly). 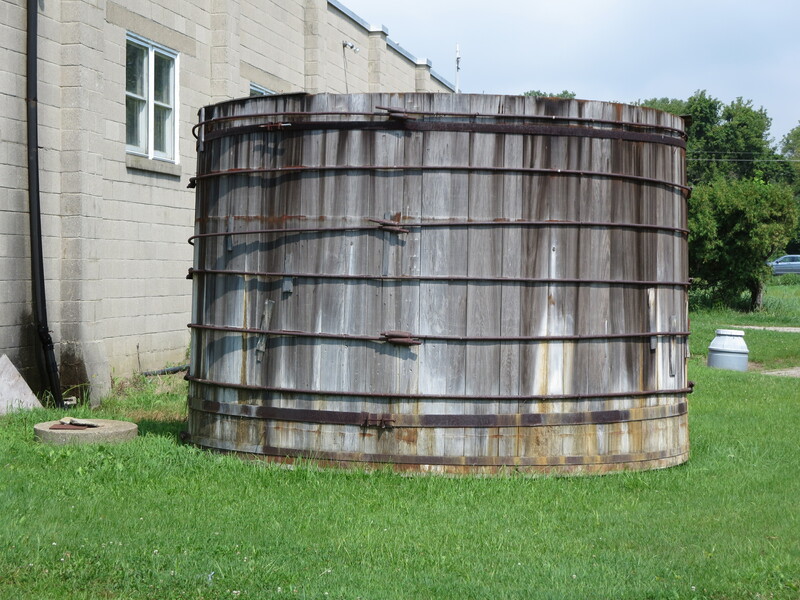 He started with the traditional methods (wooden barrels and salt brine) but he experimented with other methods and developed innovations that increased the quality. They supplied many large food retailers with product, producing products under those retailers’ labels, but they also co-packed for other processers. Beginning in 1948 they started offering products under their own Lakeside label and they haven’t looked back since. They still co-pack for other processers and they do some private label packing too – but the bulk of their revenue is from Lakeside brands. The company is in the hands of the second and third generation of Woodbridge, with founder Charles’ son Donald at the helm as president of the company and together with his wife Heidi (CFO) and their son Alan (vice-president) and Alan’s wife Susan. Here’s a short video of Alan talking about the company. They produce over 70 products and sell around the world. Indeed, their biggest market is Germany. My favourite story is that they sell sauerkraut to Germany! Go figure… Their second biggest market is Australia, which explains why they have three clocks in their small office/retail shop: one that shows the local time, one that shows the time in German, and one that’s shows the time in Eastern Australia. Besides pickles, peppers, and relishes, they also produce a variety of hot sauces, pasta sauces, barbeque sauces, and salsa, most of which are proudly Foodland Ontario labelled, which means the majority of the ingredients are from Ontario. 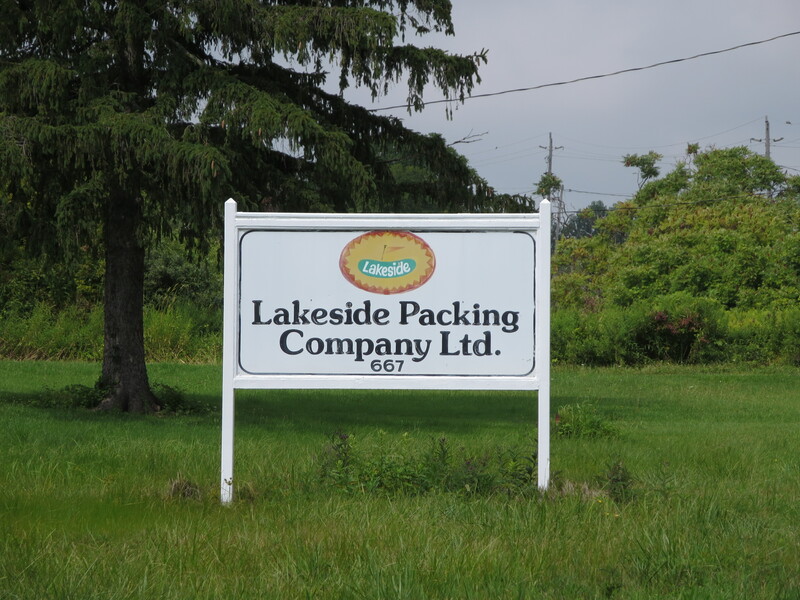 One other interesting – and kind of disheartening – fact about Lakeside Packing is that they are the last packer in Canada. Alan does much of the development of markets around the world, but he also had a hand in product development. 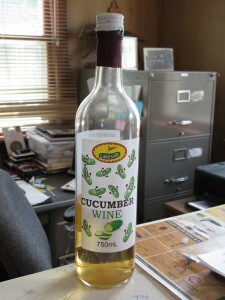 One of his latest innovations is cucumber wine. It’s not ready just yet, but he expects it will be soon. 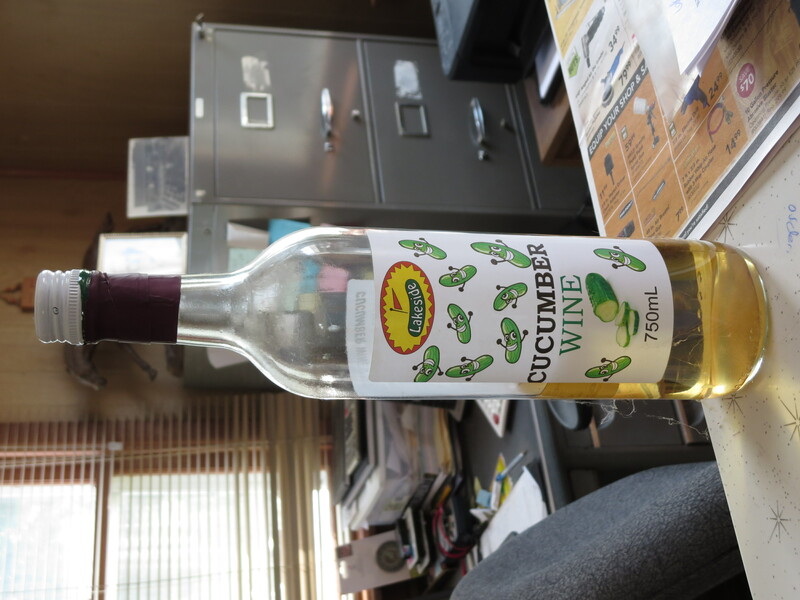 I asked whether it will be more like a wine-based vinegar or something that you might use in cooking and he clarified that it is definitely going to be a sipping wine. (I tried to coax a sample out of him but the bottle he had had been opened a few days and he was concerned with the oxidation – but he said maybe next time I stop in). In my last post I wrote about the fact that there isn’t going to be a grape harvest in the Lake Erie/Pelee Island region. In chatting with folks at the wineries in that region, I was struck by how many of them shrugged and blamed “the Polar Vortex”. No matter what you call it, the impact of the winter is clear: very few grapes. 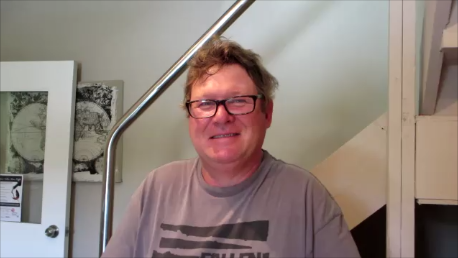 I shot a short video of Martin Gorski, owner/winemaker at North 42 Degrees Estate Winery, describing in a bit more detail the unusual growth pattern they observed among the vines this spring-summer. On Friday night I was at the Shores of Erie International Wine Festival (SOE for short), in Amherstburg, Ontar io. 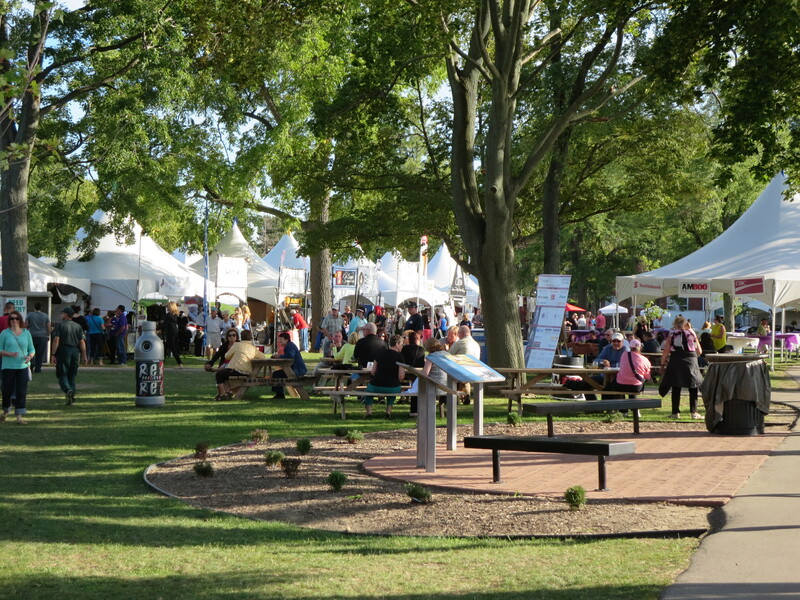 The SOE is a four-day festival showcasing wineries from the so-called EPIC region (Essex, Pelee Island, Coast) along with food prepared by well-known restaurants from the area and live bands. This year is the 9th edition of the popular festival, with tickets selling out in advance for the Friday and Saturday festivities. 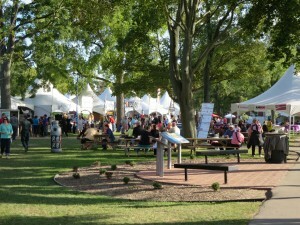 The festival is on the grounds of historic Fort Malden, which overlooks the Detroit River. 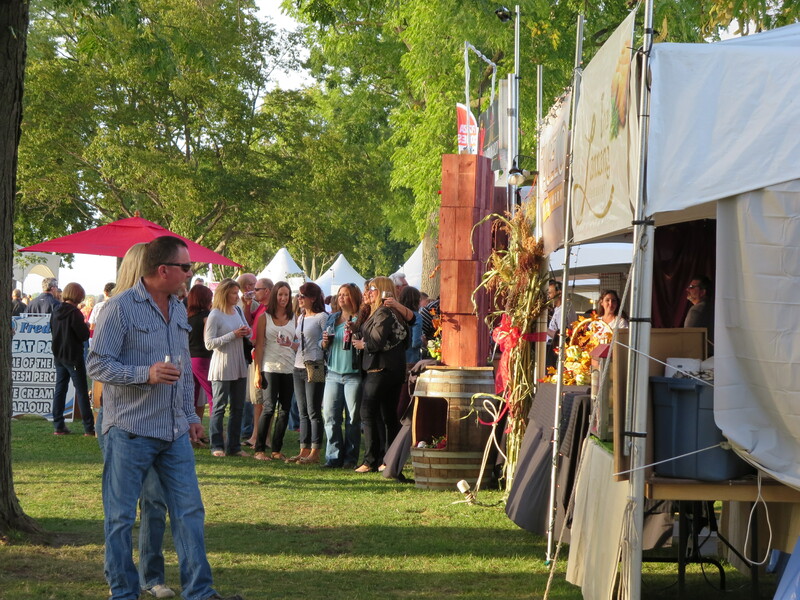 The crowd on Friday night was big, but it didn’t feel crowded because all the wineries had two booths and there were plenty of tables of all sorts where folks could sit and socialize. 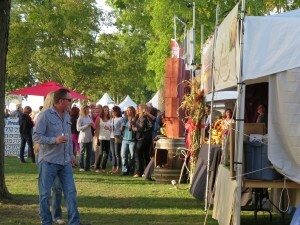 It was clear that many of the people there make it an annual event – a place to go with friends and enjoy great wines and tasty food at reasonable costs. To get wine you purchased poker tokens for $5. A 5 oz. glass of wine was 1 token at all the wineries, and entire bottles were 5 tokens. You paid for food directly at the individual booths. 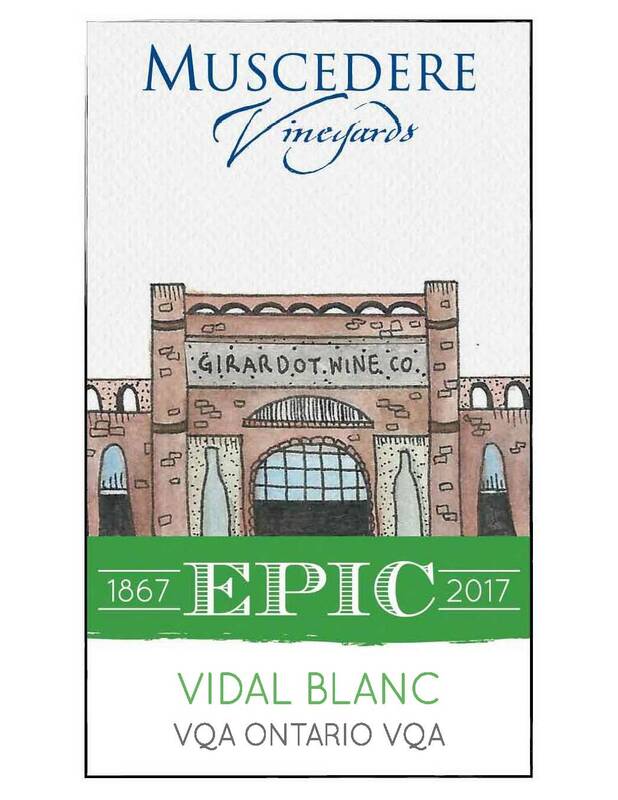 Besides going to the wine festival, I also stopped in at some EPIC wineries I hadn’t been to before and I’m working on entires for those wineries. So, watch for an update of the App soon! 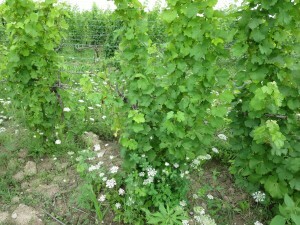 I’m just back from a day of visiting wineries in the Lake Erie/Pelee Island area. 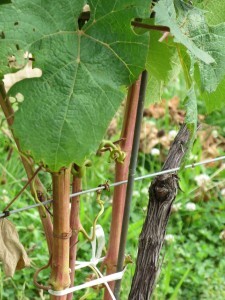 One of the biggest surprises was how tall and full of leaves the vines are out there already. I know the area is the southern-most wine region in Ontario and so it has a slightly longer growing season than elsewhere in the Province, but seeing how far along the vines are really drove home the climate difference. The weather was perfect for the drive from Toronto, which was much quicker than I thought it would be. Since the drive was shorter than I expected, I had more time to spend at the wineries, which was great. I stopped at a number of wineries. Because it was mid-week, none were too crowded, which was also a bonus, as that means folks at the wineries had more time to chat and show me around. At Erie Shore Vineyard, for example, Harvey Hollingshead, who owns the winery along with his wife Alma, took time to answer my questions about the winery. Even better, when I asked him about the young grape plants that looked like they were ready to be planted, he did a bit of show-and-tell for me. You can watch Harvey’s explanation in a short video I shot of him. 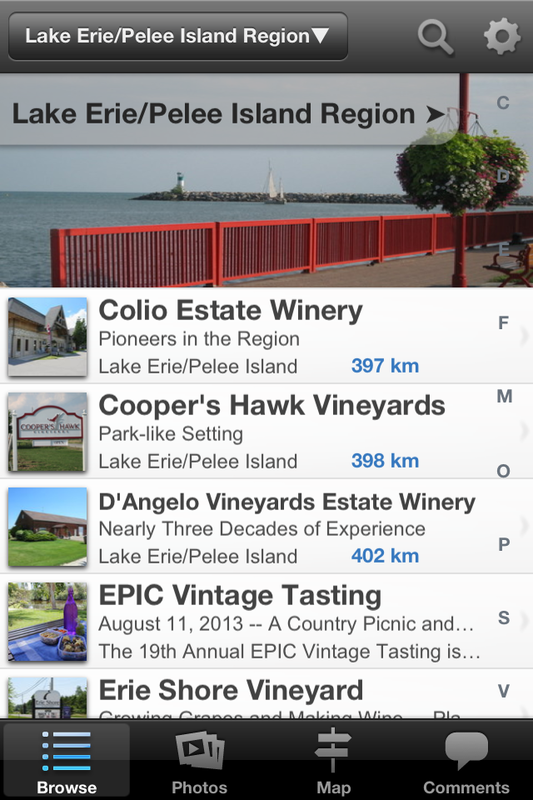 The Lake Erie/Pelee Island region (which the local wine tourism association has branded EPIC: Essex Pelee Island Coast Wineries) has a number of long-established vineyards and wineries and a number of lovely new ones. In the next App update you’ll find entries for the six I visited this week, and there’s more I’ll be visiting in the future.